Maxima is a sturdy scrubbing machine built with the best components and a striking design. A refined engineering combined with high quality materials led to a model made to last, reliable and able to reduce the total cost of ownership. It provides the best flexibility in terms of configurations. 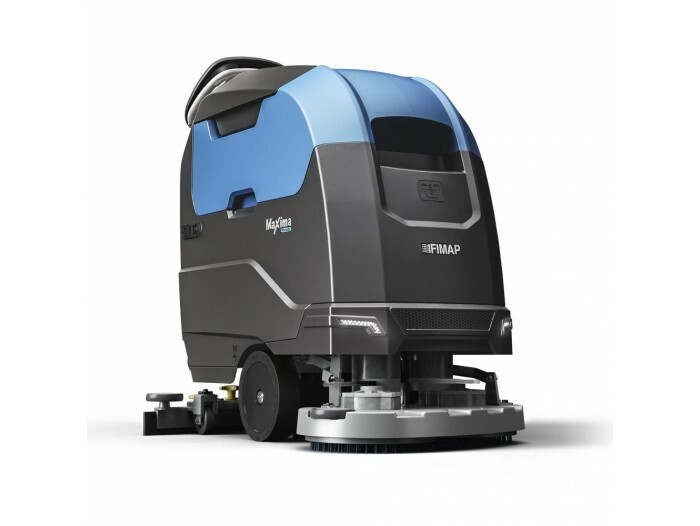 It is available as a scrubbing, scrubbing-sweeping or orbital machine, and can be arranged in basic, Pro or Plus versions. It is suitable for cleaning supermarkets, warehouses, production areas, gyms, showrooms and workshops. The sturdy design reduces breakdowns, extends the machine lifetime and helps you save time and money. The outer body surrounds the machine internal structure and mechanical parts, protecting them from accidental impact. Aluminum and polyethylene enchances machine realibility over time. On-board machine instructions and intuitive instrument panel ensure easy and safe operation, without training. Parts which must be cleaned regularly at the end of every shift are colour coded in yellow for easy identification, saving time and making sure that your scrubbing machine is kept in perfect condition at all times.